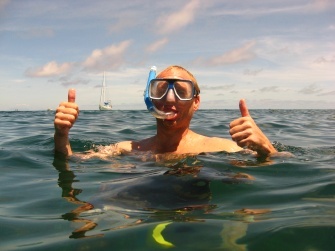 Yesterday we finally enjoyed our first snorkelling trip since we’ve been back to Cairns. Early in the morning we went to the Reef Terminal eager to board the Big Cat Cruises, the company who would take us to GREEN ISLAND. Green Island is located only one hour away from Cairns, but it is very different. As soon as you leave the coast, the water changes to a green color and then to deep blue, to change once more when you get close to the island, when it becomes turquoise blue. 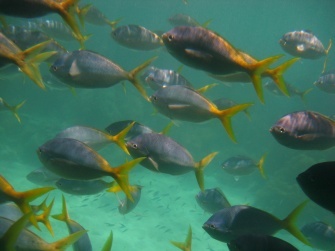 Green Island is part of the Great Barrier Reef Marine Park. The island is a beautiful coral cay that was formed during 6000 years of winds, waves and currents sweeping reef debris on to the sheltered side of the reef. Vegetation grew on the island thanks to the seeds washed ashore or brought by birds. And nowadays, what we have is a beautiful island readily identified from the air by its emerald rainforest surrounded by white sandy beaches and beautiful coral reefs. Just another interesting note: the white sand is the result of thousands of years of corals dying and desintegrating on the bottom of the water. We got there around 11am and went straight to the beach to do some snorkelling and, of course, to try our DIGITAL UNDERWATER CAMERAS As you can see in the images below, we still have a long way to go in the underwater photography world, but some of our customers have been taking extremely good photos of the reef. 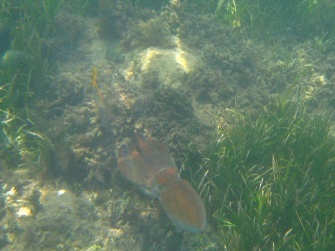 In case you cannot distinguish what they are, the first one is of a very colourful fish, there were dozens of them, and the second one is a picture of an octopus. Steve freaked out a bit, he’s a bit wary of everything that moves underwater, so we asked the lifeguards if they were dangerous and the assured us this type of octopus isn’t. So back to the water for another session of snorkelling. We also booked a glass bottom boat tour and a semi submersible tour as part of the whole Green Island experience, so after lunch, a delicious tropical buffet, we were ready again for more excitement. A couple of very interesting facts: Green Island was the first place where a glass bottom boat operated, is home to the world’s first underwater observatory and even the first movie theatre located on an island. The glass bottom boat took us a few metres off Green Island. It consists exactly of that, a boat with glass bottom, where people sit on the sides of the boat, so the bottom is empty and you can see everything that comes underneath the boat. We saw a massive sea turtle (sorry, I was too slow to take a good pic and we missed it), lots of different species of fish, including a fish called “sucker fish”. It has a type of suction cup on the top part of its body. They aren’t a very energetic type of fish, so when they run out of energy, they attach themselves to anything that moves. The semisubmersible was my favourite tour. You sit in the bottom part of a boat, where all the side walls are made of glass, so you can see what’s going on around you. 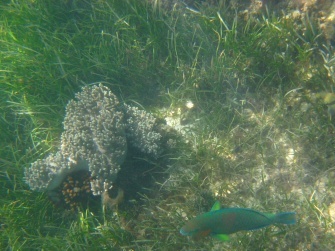 Again, we saw heaps of different species of fish, including another sea turtle and a couple of reef sharks. But my favourite were this colourful type of fish that travelled with us all the way. I learnt something hilarious: there is a type of fish commonly called “mother in law”. Why? Because it tastes so bad that the only person you would serve it to would be your mother in law. After finishing these two tours, we went back to the water for another half an hour before the cruise departed for Cairns. The water around Green Island is so clear that I could have spent all day having a swim or snorkelling. Besides there is a swimming pool on the island open to every visitor, as well as some bars and cafes where you can get that cold drink or ice cream you look forward to after a hard day’s work. We look very stressed, don’t we? 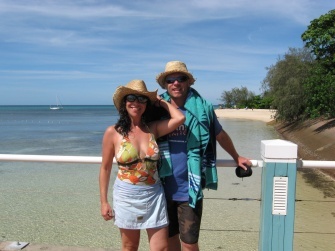 Anyway, we really enjoyed a cold drink before we went back on board to return to Cairns.